Robert Levine is a Media Technician and the Director of Production with the College of Communication and Information. He has 27 years of experience in TV production, with 20 of those years working with Florida State, and specializes in Computer Graphics and 3D Animation. 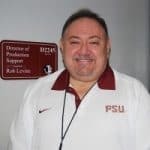 Robert has been Promotions Director for two different TV stations in Tallahassee and now oversees technical and logistical operations for Seminole Productions (one of the School of Communication's Media Production Facilities) and the Media Production Program.